I came across this star in a book. My daughter had never worked with aluminum foil, so we decided to give it a try to create a Eid star decor. For this project, we actually used a foil that is an embossing foil, and not the type that you have in your kitchen. It is from a company called Paragona and it was a medium gauge. Our star pattern was about 7 1/2 inches wide and we made sure to find one online that had lines going towards the center. Put your pattern on top of the foil and use the embossing tool to trace the outline of the star. Once the pattern in traced, make sure you also trace out the lines inside too. Use scissors to cut out your star. Using the embossing tool, make swirl lines all over the star, or you can decorate flowers, moons, circles, etc. It’s your star, so have some fun with it. Don’t go over the five main lines. After your star is decorated, squeeze each side of the star towards the lines to give it a 3D effect. Using the wire cutters, cut about 12 inches of the gold wire, to make your hanger. Using a very small hole punch, poke a hole in the top point of the star for the hanging wire. Fold the wire in half and twist it on itself to give it extra strength. Make a loop at the top of the wire so that you can hang it when you are done. Poke two holes in the star points that are the oppose of your hanging wire. Cut the blue wire. Start twisting it around your bamboo skewer , stopping along the way to add beads. At first it was hard to hold onto the wire end that was sticking out, so I added a little loop so that it won’t poke little fingers. 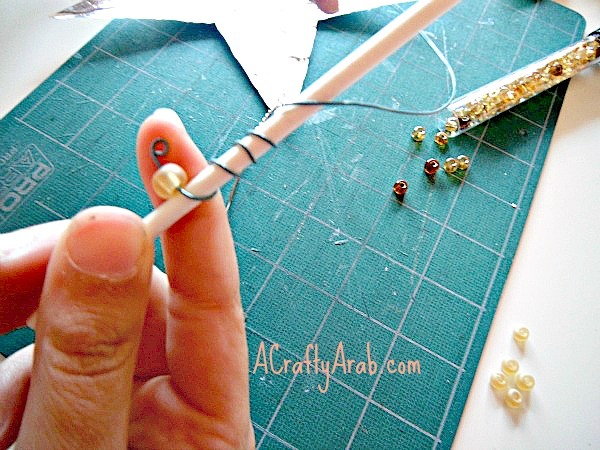 Continue to twist your wire, adding beads as you go. Poke it into one of the bottom points and with the pliers close the loop. Do the same with the other end (if you closed the loop earlier, you’ll need to open it again to fit into the hole). Hang your star and enjoy! Make more for a whole banner and maybe try different colored foil! Or stop by A Crafty Arab on Pinterst to see more fun DIY crafty tutorials.